Hum. I really wanted to like this, but it was just okay. I always put my snails in shells, so maybe that made a difference. I think there was too much butter and not enough garlic. Don't get me wrong, all of the snails were eaten, but no one raved about them. p. 104 What attracted me to this dish in particular was the surprisingly short cooking time, especially for a ragu. Prep of the long list of ingredients was made much easier by using the Cuisinart to dice all the veggies. I was especially surprised how thick the sauce was almost immediately after adding the tomatoes. (1st photo). The heady aromas of the Middle-Eastern style spices was intoxicating as the sauce simmered away. We served this atop pasta and absolutely loved it. Thankfully there was plenty of sauce leftover and I plan to serve it layered in a casserole w some roasted, sliced eggplant. If this recipe is indicative of the quality and flavours of other dishes in the book, this will definitely be a keeper! This is the first flop recipe that I've made in this book. It cooked much quicker than 1 hour. The potatoes fell apart. The entire dish was bland. I ended up mashing the potatoes and made it into a soup to be served the next day. We thought the caramel was too sweet. This was a fun recipe that I would try again. I needed to add water to the caramel to thin it. 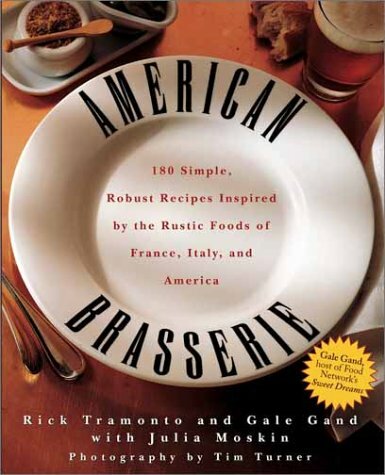 Award-winning chefs Rick Tramonto and Gale Gand have translated the French brasserie into a style that is uniquely American. In American Brasserie, they share 180 of their most beloved recipes from their acclaimed Chicago restaurant, Brasserie T, so that cooks everywhere can enjoy the pleasure of brasserie-style fare at home. Reflecting the classic dishes of France, Italy, and America, it is filled with delights to savor, from perfect starters like French Onion Soup with Gruyere and Country Mustard to superb desserts like Chocolate-Almond Biscotti. The book also features gorgeous color photographs that capture the energetic atmosphere of the American brasserie. Rick Tramonto and Gale Gand are a husband-and-wife chef team that have created several acclaimed restaurants in the Chicago-area, including the restaurants Brasserie T and Tru. Tramonto is the winner of the James Beard Award for best chef in the midwest and Gand is the host of Sweet Dreams on the TV Food Network.